Browse content similar to Phil Vickery and Martin Offiah. Check below for episodes and series from the same categories and more! There will be worthy winners, and valiant losers. I feel like I'm literally going to war! most notably for teams Widnes and Wigan. because you were a proper superstar, weren't you? Well, you're showing my age there! I'm obviously a generation before you. in the world of rugby union. for 2003's glorious victory in the Rugby World Cup. So, we can expect this to be a competitive event. I feel like I'm on a roller coaster, right now. It certainly is going to be a wild ride. dating from way back in 1952.
why I'm letting YOU drive ME around in this vehicle. seems to be giving them a bit gyp. She's warming up now. She's happy. She's warming up. What do you know about antiques? -Seriously, you must know something. -I know they're made out of wood. Obviously, wood antiques are made out of wood. and silver expert Margie Cooper. It's Thelma And Louise, this! It IS like Thelma And Louise! They're piloting a 1980 Corvette Stingray. And is it good to drive? It is very good to drive. in the city of Bristol. My agent didn't really explain this! We get that a lot, Martin. But, no matter, it's time for celebrities to meet experts. Oops...! Martin seems to have lost this hat. -Do you want me to give you a push? when you leave him in charge of anything. That's what you call a road trip! who is going to go in... which vehicle? It took you all of a nanosecond. Am I going to be pushing this? -Yeah! Oh, well, I don't mind being stranded with you. That's fine. It's all good. You ARE getting on swimmingly. It's time for the off. -It's part of the excitement. where they're meeting dealer Jenny. Time for a proper rummage in this centre's ample stock. I love a good rummage. Oh, good. So do I. They're really casing the joint here. So, what are we looking for, Martin? What do you like? Phil has made it perfectly clear on day one that he wants to win this. -So, does he live around here? from these parts, as they say. -to his neck of the woods and win. -Oh, that is fighting talk! This match is definitely on. But does Martin have any form in the antiques game? I've got a few antique-y pieces. and I've been to a few car-boot sales. so get down, get rummaging. I have bought something at a car-boot sale and sold it for a profit at auction. I never do that. Well done. Who's the expert here, again? So having a good old rummage here. Soon, Martin spotted something hidden in a jumble of stock. I mean, it's jolly quirky, isn't it? probably dating from the 1970s. Would you have that in your house? when I lived in Manchester. -I used to charge people 20p to use them. Hey, you're a shrewd customer, Martin. I like it. Ticket price on the fruit machine is a substantial £140. Time to speak to dealer Jenny. -Deep in the bowels. Yes. It is full of old coins. So you're OK.
You've just got no key to get into it. But it does light up when you plug it in. It is being sold as a decorative item rather than a functional game. So will that help them on the price? Can we come under the hundred pounds? Is there any chance? -We would want to be getting it for £60. -You're going to take it away today? So you're going to move everything, tidy up afterwards. Cold, hard cash. And I've got a rugby player to help me lift it out. Cool. 80 at the absolute death. And it'll be just for the fun of watching you try and dig it out. So, are we doing a deal? -Yes, we'll do the deal for 80. Now, they just have to get it out of there. Good thing Martin's here, eh? That bold deal shows he's got the brawn and the brains. -Yeah, we've got a hill to climb yet. Now, Phil and Margie are motoring on in the Corvette. And Margie's quizzing Phil on his knowledge of the competition. So, do you know Martin? -I do know Martin, but we're a generation apart. -particularly from his rugby league days. So, he's not going to do that in the shops, is he? I doubt there'll be room, Margie. He likes a bit of fun. But let me assure you, he won't want to lose. So...it's going to be interesting. And we cannot let Martin beat us. Oh, no! You're putting pressure on me now. -Hello, good morning. Welcome to Cirencester. There's plenty to see in this shop, so best get stuck in. but these two seem happy, well, just to have a lark about. Hey, I don't think that strikes the right note. Soon, Margie's quizzing Phil on his triumphant turn on TV's MasterChef. -John Torode and Gregg Wallace. -Yeah. Well, Gregg's easy, just anything sweet. Hey, an uncanny impression, Phil. -That's modern, that's been tampered with. -I say, I watch these type of shows, you know. And his discerning eyes soon settled on something else. -Have you got the key, darling? Phil is smitten with this piece of vintage militaria. I like it, because it looks used. I like it. I'd like to buy it. -I can try and do a bit for you. -Yeah, but it's not worth 45, is it? -That's the reality of it. -£30? Got a deal. Nice doing business. Blimey, Phil doesn't mess about, he's off like a shot. And they've got their first item for £30. Now, Margie's got her eye on something. -Those little things at the back there. and they've really taken silver expert Margie's fancy. And, you know, they're Victorian. -I think they're quite sweet. You're the encyclopaedia of silverware extraordinaire. -If you like them, I like them. We like them. -If they can be 30, I'll close the deal on those. OK, then. Go on. Deal. And with all the coordination of a professional athlete. So we're going to what? £32.50? But these two know what they want. a second sterling deal all wrapped up in record time. -Right, that's lovely, thank you very much, Brian. and driving to their next shop. The trusty old Land Rover seems to be back to full health. -Best car ever for the Road Trip for me. There is a lot to be said for good old-fashioned engineering, I think. -I thought you were going to say, "They made things to last back then!" in their next shop. They're heading for Armchair Antiques. -Hi. Hi, Christina, how are you? -Hi, very well, thank you. -Martin, pleased to meet you, how are you doing? ..though there are some other items dotted about, as well. Dartboard, yeah, that's my recreation. That's not for sale. So how much money would you want for said comics in a box? this afternoon Christina's taking the lead. -Oh, that one, yeah. That's quite nice. So this is, obviously, a canteen of cutlery. presented rather cunningly in a mahogany table. sauce ladle, we've got, obviously, a carving set. -Well, it looks like a nice piece. -I haven't seen anything like this before. -What have you got on that, James? -I've got 100 on it at the minute. -..but don't like it that much. What's the best we could do with this, do you think? What sort of price were you thinking of, then? Don't say 30. Crumbs, Martin, you're getting the hang of the hard haggle. -£40 then and, yeah, we'll shake on that. What a deal! Talk about tackling them low. They get the table and all the cutlery inside for a bargain £40. But they're still scouring the shop for more items. This is a bit random. Why have you got a Canterbury underneath here? Oh, we collect so many things over the years. It's got quite a lot of dust on it, James. -That's been there for a while. It can be, yeah. Don't know why I put it there, to be honest. That's all right. Oh, blimey, I've just managed to pull it to pieces. -Oh, blimey! I really have managed to pull it to pieces, look. Is that to try and get the price down?! I wouldn't put it past her, James. -It looks like a magazine rack. -Yeah, it's a Canterbury, exactly. used for storing magazines or sheet music. I do think it needs a lot of TLC. -I mean, it's a project piece, isn't it? Would you kill me if I said a fiver? It saves it getting any more dusty. Yeah, go on, then, we'll do a fiver. Another bargain on the rack James didn't even know he had. Thank you very much. James, you're a star. Right, have you got a duster and some glue? We'll sell it like that - we'll still make money. and country boy Phil is filling Margie in on some of his interests. with the farriers and the shops. -It's part of our heritage, isn't it? I think it's an important part of our heritage. they really are in for a treat today. and assistant polo manager Kim. -Welcome to Cirencester Park Polo Club. -Nice to have you here. certainly has an illustrious past. in the grounds of his own estate, here in 1894. 120 years of history at Cirencester, that's quite a lot. Which is a history full of stories. But the game of polo has been around just a little longer than that. Where did it come from and how long has it been a sport? What's the history of it? -I don't know, 600 BC, somewhere like that. and was embraced most firmly by the highest echelons in society. who arguably gave us the game as it's played today. he formalised the rules in 1938. And pretty much the same or very similar to what we use now. one of the club's most prized possessions. -Here it is, the Warwickshire Cup. -Wow, that is a trophy. and one of the most illustrious. It's one of the sort of top three tournaments in the country. the Queen's Cup and the Warwickshire Cup. Can you go to dinners off the back of winning this or not? I'm sure they could, yeah. Just like you, Margie, stunning. Well said, Phil, you're a gent. But, of course, they can't come here without having a go themselves. I thought you'd do that! I tell you what, this polo lark's easy. Don't speak too soon, Phil! Do you think we're ready for the real thing? It's years since I've done this! That's enough horsing about, you two. Look at that - perfect! and ready to start their new career as polo players. Thank you very much, everybody. You've been very patient with us. No, it's been great having you here. It really has. it's the end of a terribly sporting first day on the road trip. when a game is afoot. The morning sun greets them back in the car and they are raring to go. and comparing notes on each of their team's dynamics. ie, she drives, she's in charge, and I just sort of follow along! I think there was a common theme there. I can assure you Margie's in charge of mine. Although the chaps have each chosen an item so far. happens when everyone knows their role, you know what I mean? If you're meant to be kicking the ball, you kick the ball. If you're a grafter, you graft. If you're a big money star, you've got to come up with some big plays. Margie and Christina are also comparing notes. Well, I am enjoying Phil's company. I shall ask mine when I see him. Phil's an MBE too. Yes. Now, don't let's squabble, girls. Look, he's been captain of England, and they won the World Cup. Yeah, yeah... Martin's muscley-er than Phil. They're all planning to meet up at the local rugby club. But the boys seem to be a little lost. Come on, guys - for ever waiting. It wouldn't be a road trip without getting lost, would it? Can't not get lost on a road trip. It wouldn't be the Antiques Road Trip, I assure you! Here we are! We made it. MARGIE AND CHRISTINA: How'd you get lost?! -Surely, you would know where every rugby pitch in the UK is. Come on, then. Let's head off. and the canteen of cutlery presented in a table. -Pleasure doing business with you, James. and the set of silver salt dishes. So that leaves them with a generous £337.50 in their coffers. -Do you carry a purse, Phil? -I don't carry a purse, actually. Martin and Christina are on the road remembering Martin's playing days. especially seeing a rugby pitch like that. has made it all the way there. -We've made it! Well done! And now it doesn't stall! Come on, that's worth a hug. Well done. where the owner, oddly enough, is called Rachel. I'm Christina, lovely to meet you. Is Rachel ready for this hard-haggling pair? There's a bit of jewellery there which is mainly silver. If there's things you're interested in, I'm always ready to do a deal. Did a lot of karate for a long time. 20 years I did karate for. Blimey, Rachel I'm not sure if that's a threat or a promise. So, they'd better get on the hunt for a bargain. What money would you have on that? Next door is a shop belonging to Rachel's dad Michael. Leaving no stone unturned, they're searching there, too. OK, this is Mike's Antiques. and Christina is taking the lead again this morning. These mermaids are really beautiful, aren't they? The weight of that...! It's phenomenal. Don't let me drop it - oh! You'd never live that down, would you? It's nice that. Lovely. I like that. Yeah? How much have you got on that? I've got 45 on it, but I'm willing to negotiate. If you wanted a couple of things, we can see what we can do. I think we'd want to be securing it in the region of £15-£20, really. I'll arm-wrestle you for it. I don't think we need to resort to that just yet. they could strike a bigger deal on. OK, well, let's take this with us. Very disappointed I haven't seen any karate moves at all. I looking at this stand. He was retailing that at 85, because it's just a particularly nice one. But I'll see if there's any movement in what he can do on it. Do you like the look of that lamp? That's a very nice Art Deco lamp. It would go very well with that bowl. I like it! Look at you - tactics! Creating a whole section of our sales in the auction. I know. He is good, isn't he? Can you reach over and get it? very Art Deco in style, especially with that chrome combination. as the glass bowl they also like. So, normally that would retail at about 85, as well. because I know you've got to make a profit. That's really kind, Rachel. Thank you. I can do them for 100 for the two - making that 55, and that 45. OK. What about 100 for the bowl, the lamp and the umbrella stand? Buy two, get one free. Martin, what's your thoughts? for us to make a profit, we really do need it at 100, I think. -I'll do it for 100. Deal done for all three at a nice round £100. Could you do it for 90? I should think so, love. -I think that's enough to take to auction. Meanwhile, Phil and Margie are in the car. And Phil's reminiscing about how he got his start in rugby. I can honestly say I fell in love with rugby as a young lad. I just loved being involved in a team. I was very lucky. I played for England Under-16s. I just fell into rugby which then became a career. You know, I didn't want to leave home. all your family, all your friends. I genuinely loved it there. she said home will be always be here for you. -And that kind of... I'll never forget that. ..a calm and pretty little place to start their own day's buying. ..where they're meeting dealer Richard. Hi, Richard. Phil's feeling the heat this morning. -Nice fan. Nice if it's warm. Oh, that's nice, isn't it? Lovely. Soon enough something's caught his eye. -Can I have an orange? They're fresh out of the fridge this morning. former England captain Phil seems keen to take the reins from Margie. I love it more than anything because it's got that Post Office. I would buy that. If I was looking and saw that I would buy that. It's a set of mid-20th century Post Office scales. There's no ticket price on them. The reason for that is I use them, but I guess I could sell them. I just have to try to find some more. But they took months for me to track those down. Have you got any tissues? I've got a few tears. scent of competition in his nostrils this morning. So how much are they for sale? It's in the shop. I can see it. It must be for sale. I need to lie down. I'm getting stressed. It is stressful trying to buy these things. I'll let you take them for £15. I think you'd make a good margin on that. They obviously are, because you've got one. He's getting a bit smart there. Martin and Christina are still in Bristol. learn about some extraordinary sporting achievements. the archivist of the British Balloon Museum and Library. -I'm Craig, nice to meet you. the largest manufacturer of hot air balloons in the world. and this Bristol institution really helped the pursuit take off. the very beginnings of mankind's ascent into the skies. -When does it date back to? with the Montgolfier brothers in Annonay in France. rising from a chimney would cause a small paper bag to float upwards. Smoke lifted the bags up the chimney. That's correct because they were paper manufacturers. and we can then get people in them. 1783 in France, in Paris. -Here's a picture here of the balloon. They took off and flew five or so miles. was provided by an open fire. The fire was suspended in the middle at the bottom there. and water to put the flames out that were coming onto the paper balloon. -Yes. Because they thought it was smoke which made it fly. They didn't realise it was just hot air. So they wanted something to generate lots of smoke. The early balloonists were very smelly. Must have smelled really nice. Smelly they might have been, but this was the birth of human flight. So you've told us a little bit about the history of ballooning. Modern ballooning started in this country in the 1960s. made of Ripstop nylon and carrying propane gas in cylinders. It just caught on as a sport then. And modern balloonists were keen to push the frontiers of the sport. What's the furthest distance anyone's travelled in a balloon? Furthest is around the world. That was done by Breitling Orbiter 3 which was made in this factory. ensuring a place in history for themselves and their balloon. -That was made here. Just upstairs here. Oh, my goodness. That's amazing. it's time for Martin and Christina to get in a balloon, don't you? and continues to help the world take to the skies. -but we have got you in a hot-air balloon. Now you can tell people that you've been in a hot-air balloon. and chewing over Phil's competitive sportsmanlike nature. My nickname the Raging Bull. Because I am a bit of a raging bull. -I'm sure you are. You're not really, are you? -You're a big teddy bear. -I am a big cuddly bear. -.."When you cross a whitewash, that's it." -I'm going to have you. because I know you want to go for me. -So the best form of defence is attack. so they'll have to really dig deep to find their last buys. Oh, Phil. You big softie. Phil Taylor could have used that. There's just so many random things. Don't laugh, because this has got to be serious now. Come on, you two, enough larking about. There's shopping to be done. You can't see half of it. I need a man. I need a man. Phil! Are you coming? There you go. That's good, isn't it? What happened there? You've got it upside down. I just wanted to check to make sure it's all in working order. Ticket price is a fittingly hefty £125. Time to speak to Les. -I was thinking 50 quid. -What's your next shot over the bows? -I'll do £80 and that's it. They're going to think on that and browse on. Some yeti hair in it, as well. -I quite like that bamboo table. on the ticket is £22. -It's got a real chance, honestly. -It has for five quid. -I can't do it for five quid. -How long has this been here for? I'll get shot if I do any less. I'm not worried about what's going to happen to you after. Phil's continuing to flaunt his haggling chops. If that's 10 quid, then I'll take that right now. -12 quid you've got a deal. -I feel sorry for him now. Those look quite nice. What are those? Now, how about those, Phil? -I tell you what, I like those. It's an assortment of solid brass lamps dating from the 1960s. The smaller ones they're interested in are at £20 each. But the ticket price won't stand when Phil has victory in his sights. Rough, this chap, isn't he? Nice of you to notice, Les. We've just had a busy day, really. I'm thinking 35 quid for three. £36 for three. £12 each. I don't care what they say about you, son, I think you're all right. Another hug. They're getting on very well. -Don't drop it on your foot. I can't leave without it. -I can't do better than 80. That is it. Honestly. And I'll take it out that door and carry it myself. At the last gasp they get the oven door as well. And they're all bought up. Well done. Which means it's time for both teams to unveil their buys. Phil and Margie are up first. Well, that's a special reaction. Once you've quite composed yourselves. Margie saw these and thought, "They could do." And I can see that being polished up and going in somewhere. -So how much did you pay for those? -That's not too bad. £12 each. And then you've got some sort of leather battered man bag. It's a military magazine holder for a sub-machine gun. So it's military, it's old, it's real. I thought a nice little piece. Paid 30 quid for that. -And what on earth is that? -This was the little daring one. -Is that a bread oven? -It's a bread oven. Cast iron about 1880. -So we thought, "We're in Bristol." We thought we'd go for that. -It's a really nice feature, isn't it? Especially as you're selling in Bristol as well. Like that a lot. So, their lots aren't so laughable after all. Now for Martin and Christina. -So, what input did you have on any of this, Martin? -So, we paid £100 for that, that and that. -That is beautiful. I love that. This is the bargain of the day even though it is slightly banjaxed. -And then I'm going to give you a lamp, Margie. But this may look like a normal tea table. No, my friends. -It's rather lovely, isn't it? With its original key. How much did we get that for? -We also got something else as well. -You bought that, didn't you? -It's got money inside it as well. Which is a bit of a risk. It was our first thing. Certainly a bit of a wacky bunch. Very much like ourselves. Come on, let's go off to the auction. when the other team's back is turned? -..about what we managed to achieve as a team. I'd rather have their lots than ours. -I think it's an issue. -What do you think of their stuff? They're laughing at us. They're still laughing at us. But that spurs me on. -Is there anything you like? -I like the oven door. That is an X factor. It could be their secret weapon. I think the baker's door for us will make or break our auction. so got to be happy with that. here at auction in the south-western city of Bristol. Christina and Margie are driving to the auction house. -Have you found that Phil is quite competitive? If you're not competitive you can't be a sportsman, can you? You were the one who was getting bolshie. Don't tell me when I was getting bolshie. You're getting bolshie. arrive at East Bristol Auctions. How are you this morning? Are you ready for the fray? Enough of the schmoozing, you lot. To the battlefield. but before the off what does he make of our teams' lots? The fruit machine is a lovely thing. Real '70s kitsch. The oven door is a nice thing. Bristol interest. so hopefully we can do well with that. Right, I think we're a team. Martin and Christina started this trip with £400. They spent £225 on six auction lots. -What do you think? Nice hat? Phil and Margie also started with £400. They spent £197 and also have six lots in today's sale. Here we go. Good luck. First, it's the Victorian Canterbury for Martin and Christina. Start me at 30 quid, then. A Vicky Canterbury for £30. 30. With a hand at 30. Thank you. £30 seated. Someone breathing a sigh of relief. At £30 with the lady seated. Do I see any advance? -That's nothing. Selling at £30. A lovely profit on an item that was just gathering dust. -Should have done better than that. Seriously, that's fine by me. Now one of Phil's picks - the military pouch for a gun's magazine. It's a lovely thing. Dual form. It's a good handbag as well. If you want. Loads of interest there. 24 on my screen there. Any advance on 24? Do I see 26 anywhere? 26 in the room. Do I see 28? 30, sir? 30 in the middle of the room. Do I see any advance on 30? 32 anywhere? That's not bad. Could have been worse. It breaks even before costs. and Christina's table containing a canteen of cutlery. Start me at a oner. 100. 100 on my screen already. We're going to go past this. 110. 100 my screen. Any advance on £100? That's still nothing. £100, the service is probably worth that. Good profit. Cheap but good profit. A tasty profit on that and Martin and Christina are leading. Now it's Phil and Margie's Victorian bamboo table with later tiled top. Someone start me £20 for it. 20, 20, 20. Someone give me a tenner. 10 with a hand. Thank you. Any advance on 10? £10, they've gone quiet. Typical, eh? Are we all done at £10? Sorry. Not a great loss so there's everything to play for. the brass umbrella stand is next to meet the crowd. 60 quid get me going. 60, 60, 60. £60 with a hand, 60, seated. That's no money. £60 for that. Surely it's got to go on from there? At £60 are we selling? 65. 70, sir? With a hand. 75. 85. 90. 85 with you, madam. Anybody else want to play? 85 middle of the room. Blimey, where there's brass, there's brass. Well done, Martin. There's a lot of heavy breathing going on on this front row. Phil thought their own brass items, the '60s lamps, were beautiful. Bit of interest. I've got 22, 24 in my book. Do I see 26? 24 with me, do I see 26? Industrial style lamp shades, all the rage at the moment. 24 with me. Do I see 26? 26, new bidder. 28. 30, yours. 30 thank you. Anybody else want to play? At £30 seated. We're not losing a lot. Unlucky - someone took a shine to them but it wasn't quite enough. and Christina's Art Deco glass, the lamp. Someone give me 60 quid for it. 60 straight in on my screen. Do I see an advance on £60? 65. No, shakes the head. My screen 80. At £80. Good. Doubled your money. Well done. It's Phil and Margie's silver salts now. The auctioneer liked them. Give me £50 for them. £50. 40 start me. 30 back of the room. I've got 30. 2, 4, now. 36 on the screen. 38. 40 with a nod. 42 on my screen. 42 on my screen. Any advance on 46? Make somebody happy. Are we done? A profit! Finally. And that sets them in high spirits. Up next, it's the Art Deco glass bowl for Martin and Christina. Will it fare as well as the lamp? 60 straight in. Thank you. No messing around. 70. 80, got 5? No. don't lose now. 90. £90. Do 92? Go on. Make a fight of it. With the hand 95. Don't be shy. Go on, it's beautiful. It's really beautiful. 95. Well done, sir. 100, sir. No. Shakes his head. Are we done? The Post Office scales he nearly had to prise from the shopkeeper's hands. 20. Straight in on the screen. Do I see any advance on £20? Good for you, sir. 22. He'll sign your shirt for that. Come on, someone else surely. 24 good for you. Don't let them go. 25.
eBay, postage, this is where it's at. 25 with you, sir. 26, madam. 25 then. Are we done at £25? You've doubled your money, you little darling. Martin made the bold choice on their expensive '70s fruit machine. -Start me at 100. 110 on my screen. 110. 120. 120 in the room. 120. 130 anywhere else? And they made good on that gamble. Just got a gut feeling in my stomach that that oven door's going to go. So everything indeed hinges on Phil and Margie's cast iron oven door. Phil couldn't leave the shop without it but will it turn a profit? Upcycle it, do what you will. Put it in a wall in your garden. Pizza oven. It's lovely. Good industrial. I've got 60 on my commissions. I will start there. I thought he said 160. 65. 70. 75. Got 5. I'm out. 75, 75. Do I see 80? Come on. £80. Think of doing the garden in the summer. I'll take 76 if someone's prepared to put their hand up. 75 with you, sir. Are we done at 75? -You've done brilliantly. You've done well. These guys picked some beautiful pieces. I think it's time for a celebratory cup of tea. I might need something a bit stronger. Martin and Christina romped away to be crowned today's victors. Go team. All profits go to Children in Need. There we go. Nearly there. -This is it. Thank you. -Come on, Margie. Let's go. -Give you a lift home. It's been a very sporting trip. Been a pleasure anyway, mate. I'm certainly going to miss them. They've been an absolute joy. 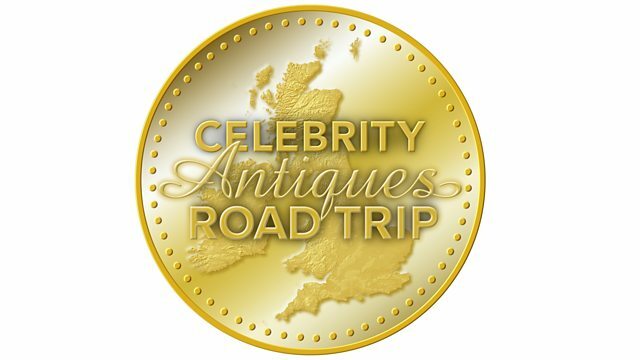 Rugby stars Phil Vickery and Martin Offiah take to the antiques trail around Bristol with the help of experts Margie Cooper and Christina Trevanion. Phil swaps a rugby ball for a polo stick and Martin finds out about man's first ascent into the skies.